What can be said of Udo Dirkschneider that has not been said. He's the reigning king of German heavy metal. If Germany had a monarch, Dirkschneider would have been knighted, by said king or queen, as Sir Udo, Knight of the Heavy Metal realms. After revisiting his Accept roots over the last year or so, Dirkschneider returns with his namesake UDO band and sixteenth album, Steelfactory. While playing with his father since 2015, this is the first album to feature his son Sven on the drum kit. As much as Dirkschneider is a heavy metal icon, so his voice and music are unmistakable. To the former, you know his raspy, yet melodic, vocal presence; to the latter, he's always delivers "keep it true" classic and traditional heavy metal. All UDO tunes are loaded with his assertive vocals, large riffs and guitar harmony, speed and rock groove from the rhythm section, and always an abundance of killer guitar solos. With this in mind, you basically know what to expect from another UDO album and you will not be disappointed. Much the same can be said for the songs within Steelfactory. You have some heavy metal speed monsters with Tongue Reaper, Eraser, and Rising High. UDO dials up the groove for essential heavy metal rock with Raise The Game, Make The Move, and Hungry and Angry, with Sven's strong drum beat at the center. There's some milder, so to speak, heavy metal with the more moderate pacing of the anthemic One Heart One Soul and Blood On Fire, which features a juxtaposing of lighter and angrier vocals. But, later, Dirkschneider turns into a heavy metal pussycat with the acoustic ballad, The Way. 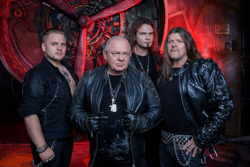 As said earlier, with Udo Dirkschneider and UDO, you get exactly what you expect: Steelfactory delivers classic melodic heavy metal in the best tradition. Recommended. 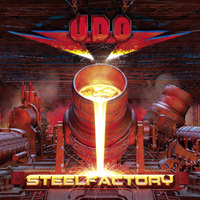 With Udo Dirkschneider and UDO, you get exactly what you expect: Steelfactory delivers classic melodic heavy metal in the best tradition. Recommended.